Seal away an ancient evil. Word for the Aura Whisper shout. Enter Valthume and speak to the ghost named Valdar. Collect the vessels from each of Hevnoraak's draugr minions. Kill the Dragon Priest Hevnoraak. "Leave, stranger. Evil stirs in this place." The Nordic ruin of Valthume lies southeast of Markarth at the end of the path that leads southeast from Dushnikh Yal. 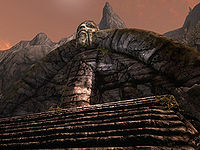 No citizens will ever mention the ruin, although the Greybeards may detect a "whisper of a word" from the location, as there is a Word Wall in the ruin. They can point you in the right direction. When you locate the ruin, there are no enemies guarding the exterior door that leads into a huge mountain. Enter Valthume Vestibule and you will immediately be sought out by a ghost named Valdar who will provide a warning: "Leave, stranger. Evil stirs in this place. I fear for the security of the very land if it should break free." If you ask for more details, the ghost will elaborate on the danger that lurks within: "We stand at the tomb of Hevnoraak, who has been dead for many generations. I fear, however, that his return may be at hand." Valdar reveals that he stayed behind to constrain the power of the Dragon Priest Hevnoraak, but that his own strength is fading away. Due to this weakness, he needs a champion to find three vessels scattered around the large ruin; their combined power can help vanquish Hevnoraak, thus saving the land of Skyrim from his vengeance. Accept the challenge and Valdar will open a gate in the back of the vestibule leading to the real ruin of Valthume. 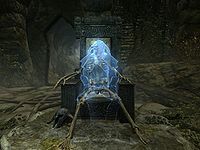 He will then sit down on his throne atop his own skeleton, and you can gather some more information on the threat waiting to break out of his prison: "Hevnoraak planned his resurrection obsessively before dying. My duty in life and in death is to make sure he stays in this tomb for eternity." 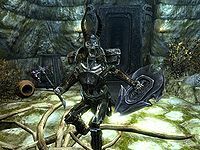 Apparently, Valthume was a former den of dragon worshippers, with Hevnoraak as their leader: "He had a way of enthralling people and built up a loyal army of followers. Good men fell under his spell and were forever twisted. Made... evil. After that, fear was enough to keep them in line. He could torture and humiliate them and they would not rebel. Even in death, they serve him still." "Even in death, they serve him still." While the exterior of the ruin only consists of a single door, the ruin of Valthume is incredibly large and far from linear; make sure to keep an eye on the map markers and prepare for a fairly long trek to gather all three vessels. The first chamber is huge, with no enemies in sight. Hevnoraak's sarcophagus stands in the middle of the room, sealed shut, with his throne strategically placed in the background. You can do nothing here now, so locate the southern stairway and jump over the pressure plate to avoid the corresponding battering ram around the corner. Proceed forward and dispose of the draugr enemies. The door to the south is sealed shut from the other side, so go through the tunnel to the east. Before long, you will stand in a huge chamber, clearly an area for offerings, which is inhabited by two leveled draugr. The overhanging ledges provide an opportunity for ranged attacks. Claim some loot in a hidden room above the altar, then jump down and open the chest on the floor. There is a trap door that will net you a fight against four frostbite spiders and a draugr carrying the key to escape the trap, but little else. Instead, take the southern tunnel and open the door to your right for the Restoration skill book Withershins. Return to the tunnel and make your way through several fire traps and beware of the four pressure plates triggering darts. The room contains two exits, both of them closed, so pull the handle near the eastern stone wall and watch it lower. Behind you, the metal gate will disappear as well, but ignore it for now and choose the eastern path. Before long, you will be attacked by a boss-leveled draugr protecting the first of the opaque vessels. After the battle, claim the vessel and the quest will update with a new map marker. Backtrack to the previous room and follow the path unveiled behind the metal gate. The next chamber is divided into two levels, and several draugr will welcome you with open hostility as you enter. Dispose of them, cross the bridge and unlock the door on the other side for some minor loot and useful potions. The room to the northeast on the lower level contains a handle that opens a tunnel leading to a room you glimpsed earlier filled with some minor loot. Return to the two-leveled chamber and locate the eastern door, leading to the next zone, Valthume Catacombs. 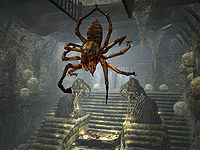 The first chamber of the catacombs features a chest in plain sight; when you open it, the attached tension cable will cause a giant frostbite spider to be released from above, along with several regular arachnids. Locate the eastern gate, pull the handle, and approach the catacomb area. Battle your way through the undead enemies and watch out for the pressure plate on the floor. Locate the gate in the northwestern part of the area and pull the chain in the alcove behind you. Face another leveled draugr and claim the second vessel from the pedestal. Before leaving, get rid of the soul gems on the small pedestals, for an easier exploration later. Locate the other exit from the catacombs and pass by the holes in the wall, now peaceful without the trapped soul gems. More catacombs await in the following area, guarded by even more draugr enemies. Make your way to the gate and pull the chain. As you explore the next huge chamber, more enemies will burst out of their sarcophagi, so fight them and jump down to the level below. Continue through the western path to an iron door, open it, and fight three frostbite spiders guarding the iron claw. As you lift the claw from the pedestal, the four flamethrower statues will all shoot at you, so head to the puzzle door and turn the rings as depicted on the iron claw: Dragon—Hawk—Wolf. Activate the keyhole and the gate will open, allowing access to the final room. The vessel is guarded by a boss-leveled draugr along with several leveled draugr, so prepare for the tough battle and claim the last opaque vessel. When you take it, the nearby iron gate will open and provide access to a word wall with a word for the Aura Whisper shout, along with a boss-leveled chest. It is time to return the three vessels to Valdar, so find the western gate for a quick shortcut back to Valthume. Raise the door bar and you will find Valdar waiting for you in the throne room. "Fools! You will not hold me here any longer, Valdar!" When you return to Valdar with the three vessels, Valdar will congratulate you and explain their original purpose. The dragon priest used them to extract his blood, his goal being to resurrect himself after death to become an exceedingly powerful lich. Your task is to empty the vessels, thus making it impossible for the priest to regain his formidable powers. The ghost will point you towards the sconce in front of the throne, so head up there and fill the sconce with the blood from the vessels. The ritual also requires you to sit in the throne, so take a seat and witness Valdar's resurrection of the weakened Hevnoraak. As the ritual is completed, the dragon priest will burst out of his coffin and yell: "Fools! You will not hold me here any longer, Valdar!" Valdar will immediately seek shelter, and it is up to you to fight the powerful dragon priest. 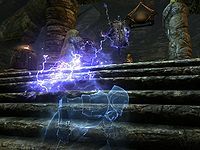 He will use his staff to cast walls of lightning towards you, which create a lasting shock damage effect. Dodge the powerful attack and corner the priest, then dispose of him as quickly as possible. When all is said and done, claim his staff and loot his dragon priest mask and a huge amount of gold from his remains. Valdar will thank you wholeheartedly, not only for saving Skyrim, but also for freeing him from his eternal duty as guardian inside Valthume. The ghost will then disappear and the quest will end. The bars in front of the word wall are removed as a result of you "reaching over" the pedestal of the third vessel to pick it up, not the acquisition of the vessel itself. As a result, if the vessel is sent flying during combat the word wall will seem to be unreachable and bugged. To fix it and lower the spikes, just jump over the pedestal. All the chains and handles for doors are right next to or just before them. You should be able to locate them easily. The spikes blocking the word wall may be reactivated by dragon shouts or objects hitting the opaque vessel's pedestal. This can leave you trapped. Use a ranged shout like Unrelenting Force on the pedestal holding the opaque vessel. If the opaque vessel is knocked down from the pedestal, the spikes blocking the word wall can be activated by placing an item on it if jumping over does not work. Walking just west of Valthumme the game will freeze. Noted about were the juniper tree is located on the western road. ? Hevnoraak may not emerge from his coffin on completing the ritual. ? Call the console commands "prid 4CF61" and then "enable". After defeating Hevnoraak, the quest may not disappear from your quest list. 3 A spirit known as Valdar has asked me to collect three vessels in Valthume to defeat the Dragon Priest Hevnoraak. 15 Valdar has asked me to collect three vessels in Valthume to defeat the Dragon Priest Hevnoraak. I brought the vessels to Valdar who told me the vessels contained the blood of Hevnoraak. I am to use this blood in a ritual to defeat him. 50 Valdar has asked me to collect three vessels in Valthume to defeat the Dragon Priest Hevnoraak. I brought the vessels to Valdar who told me the vessels contained the blood of Hevnoraak. I used the blood to weaken and awaken Hevnoraak, and defeated him. 60 Finishes quest Vader [sic] has asked me to collect three vessels in Valthume to defeat the Dragon Priest Hevnoraak. I brought the vessels to Valdar who told me the vessels contained the blood of Hevnoraak. I used the blood to weaken and awaken Hevnoraak, and defeated him. Valdar told me to take his iron mask and faded away. The following empty quest stages were omitted from the table: 0, 1, 2, 5, 20, 30. On the PC, it is possible to use the console to advance through the quest by entering setstage dunValthumeQST stage, where stage is the number of the stage you wish to complete. It is not possible to un-complete (i.e. go back) quest stages, but it is possible to clear all stages of the quest using resetquest dunValthumeQST. This page was last modified on 18 April 2019, at 01:30.